In our trendy world where styles come and go in a matter of years, it’s important to get in touch with your personal interior design style. What do you like and what do you love? Learn to use your favorite things to develop your personal interior design style that will please you and offer a basis to build upon. This is the best way to get a room that will be a reflection of your personality. Pick one room – start small. 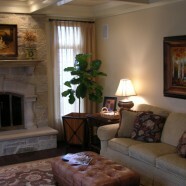 Identify the furniture or furnishings that you love in that room. This may include a favorite sofa, cabinet, artwork or even a rug. Maybe you have a family heirloom or you plan to purchase an item of furniture that creates a style statement.